T&E Auto Haulers recently built a new 56' All Aluminum Semi Trailer for Jim Mowrey. The Mowery family owns and operates Mowrey Auction Company in Milford, Illinois and is active in the ITPA Pulling Series. They run in the ITPA Super Farm class with their two John Deere pulling tractors named "Deal-n-Deere" [a JD 8420] and "Auction Express" [a JD 7930 model]. The Mowrey's have great taste and optioned out their trailer to match both their ITPA pulling and auction business activities perfectly. 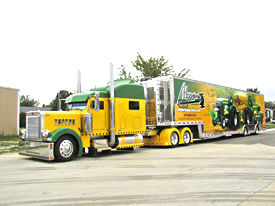 They pull their new T&E trailer with a customized Peterbilt semi tractor which features an exterior and interior that matches their "Deal-n-Deere" tractors theme. Once they took possession of their new trailer they had it wrapped in a custom vinyl graphic pack which features both pulling tractors as well as their auction service. The truck and trailer combination is certainly an "eye catcher" when heading down the road between pulling contests or auctions. The 56' T&E All Aluminum trailer features heavy duty interior ramp platforms to allow easy loading/unloading via an interior winch system. There are also storage cabinets and Lista tool box units built into the lower portion of the interior ramps. Towards the front of the trailer there are cabinets for merchandise sales items and general storage, as well as a bathroom area with sink and vanity. There is a 20 KW Powertech diesel generator located in the polished stainless steel clad front box unit at the front of the trailer and the Trane air conditioner and air compressor also reside there. The heating and air conditioning system is ducted throughout the trailer to allow a comfortable environment in both work area and lounge. The front of the trailer features a full lounge with T&E custom fold down bunks, leather sofa's, LCD TV w/entertainment system, DirecTV satellite system, a kitchenette w/Corian countertop and sink, microwave and refrigerator. A custom mirror treatment lines the front wall of the lounge and the floor is covered in custom tile. The Mowery's certainly have all the comforts of home when they are out attending pulling events! Since Jim also uses the trailer with his auction business, there are multiple tv monitors located throughout the trailer so that bidders can keeps tabs on what is on the auction block at any given time. The tv monitors can be quickly taken from their storage mounts and hooked up to locations on the exterior side doors and a front cabinet in the main storage area of the trailer. There is also plenty of interior and exterior lighting available for night time work activities, whether it be at pulling events or at one of Jim's many auctions. T&E Ent. Auto Haulers manufactures each of our trailers paying close attention to strict quality control requirements and keep the customer involved throughout the entire building process. As a result, all of our trailers are built to exactly match each customers needs, pull like a dream and are built for the “long haul”. You’ll also get top resale value when it comes time to sell too! Why not give us a call today at 815-426-2761 for a no pressure quote on a trailer to fit YOUR operation? If you’d like to learn more about what we have by using an online format, please use our online contact form to express your needs - we'd love to talk informally with you. 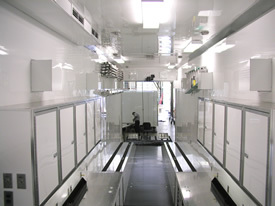 Note: Many of the storage cabinet options shown are also available on our smaller trailers. We welcome your personalized storage ideas and can custom build most anything you desire. T&E is a Dealer for Arrow Awning Products and Accessories. We can supply their parts custom configured and installed for your unique needs. Our other awning suppliers are Carefree of Colorado, and Girard Systems. We can have a custom awning manufactured for your trailer and professionally installed to your specifications. T&E can also upgrade your current trailer with custom work area cabinets, awnings, ramps and much more. We are also a full service facility capable of a wide range of trailer repairs and maintenance. Please contact us for a no obligation quote. Click here for more information about our service and repair capabilities. T&E Auto Haulers offers a full range of All Aluminum Trailers designed to meet the needs of motorsports enthusiasts. From our Rivet Side Pull-a-Longs to Pro Semi Trailers featuring the ultimate in Quality Construction...Aluminum Plate Side...we can meet the needs of the most demanding racer. And, we are proud to offer a wide variety of options and amenities to make your trailer custom tailored to Your Operation! Please feel free to take a few minutes and download an Options List showing available configurations and options for our complete line of trailers. Print it out and mail it to us for a no obligation quote. You may also fill this form out online and return it to us instantly via email by visiting our Quote Request page.